HPR & SA: How do you feel, when you dive in the Ocean? Andrea Casini: I feel free. Can you say more about it, please. Diving in the Ocean means immersing into the planets’ largest habitat, virtually limitless, feeling weightless and one with the deep blue and its’ inhabitants. It seems without limits, but it’s not. That’s right. 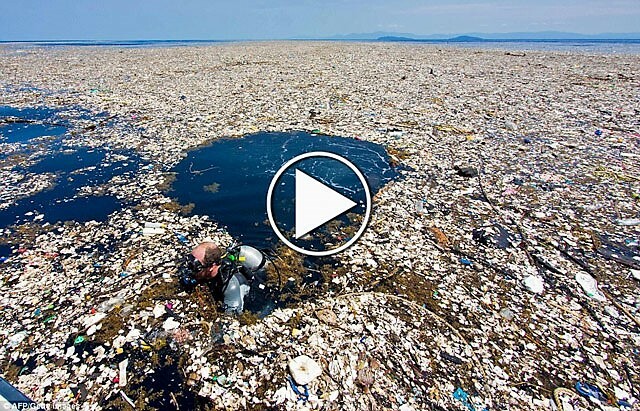 Human interference is visible everywhere, despite the seeming vastness of our Oceans. I have no dive without noticing evidence of human impact. It is a generally depleted environment, suffering from overfishing, ship traffic, exploitation, noise, pollution, waste and plastic, in which animals can entangle themselves. Filming with my professional partner Rafa Herrero for the BBC documentary Blue Planet II, we had a heart wrenching encounter with a grieving pilot whale mother. She did not let go of her dead newborn for days. The dead whale calf was doubtlessly a victim of human-caused pollution. Public response after the showing of these scenes on TV was enormous and as a result scores of people joined NGO’s to protect the marine environment. You have had countless encounters with the particularly iconic ambassadors of the seas – the whales. Yes, especially with pilot whales, a big species of the dolphin family, up to 6 meters long. It’s amazing to be in the water with these incredibly intelligent and social beings, who invite you into their world as much as they can towards a human being, who is not an overly aquatic creature. Andrea Casini is an Italian cameraman, photographer, producer and free diver, living on Tenerife, Spain. Do you have an explanation why pilot whales and also some other dolphin and whale species behave friendly and curious towards human beings? No … It’s kind of puzzling actually, considering what humans have done and keep doing to dolphins and whales and their habitat. Thousands are being killed as bycatch accidentally and out of neglect in fisheries year after year. In various countries, cetaceans are still actively being hunted, pilot whales for instance also on a European archipelago a few thousand kilometers north of here, the Faroe Islands. The fact that many cetacean species behave friendly and cautiously consider the fragility of humans being in the water is mysterious, if not to say mystical. Meanwhile, Loro Parque, a big Zoo and Fun Park on Tenerife, the island you live on, is keeping dolphins and orcas in captivity. What do you think about that? It’s ironic and tragic in various ways. By the way, orcas are also from the dolphin family, the largest kind, by far. 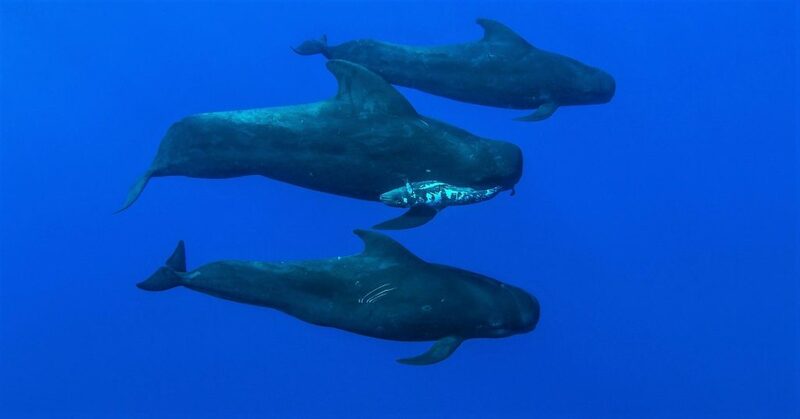 And they are closely related to the pilot whales. At times orcas can also be observed in waters around Tenerife and other Canary Islands. Around here, these majestic creatures like many other dolphin species and whales provide the perfect opportunity to encounter them in their world, in the wild, through sustainable whale watching operations. Yet, some people have decided to confine such highly evolved, sentient, self-aware animals into tiny tanks in order to perform tricks to the audience. This is very demeaning and horrible in my eyes. Just to give you an example: Loro Parque puts orcas, who swim up to 150 kilometers a day in the ocean, in tanks that are smaller than a goldfish bowl for a gold fish, relative to the body size – and much more boring. It would take an orca about 4000 laps in her tank to swim the same distance she might at sea. Yet, just a few years ago, Loro Parque has added a new animal to its’ “orca stock”. That’s right. She’s called “Morgan” and had been taken from the wild in the North Sea in 2011. Her family lives in Norwegian waters. All other orcas at Loro Parque are captive born. Apparently, those have not accepted her. To make things worse, Morgan has been put into the one same tank with Keto, an adult male orca. The obvious attempt to get Morgan pregnant as soon as possible, was successful: She has given birth in Mid-September. Keeping orcas means multi-million-dollar business. Just like all other dolphinaria, Loro Parque and Siam Park, the other facility with captive cetaceans on Tenerife, claim to contribute to the protection of the oceans through education. That is cynical. By taking endangered animals from the wild, they contribute to environmental destruction. And they send the message out to millions of people that it is okay to stuff huge wild animals into tiny tanks and to turn them into clowns. The average person who watches a dolphin or orca show has no idea what an ordeal these highly sentient, self-aware and social beings are going through, both mentally and physically, day after day, year after year, for a whole miserable life time, stuffed into tiny, boring concrete tanks. Loro Parque and Siam Park are owned by the same company, by the way. Does this company have a big influence on Tenerife? Indeed. It is the biggest employer on the island and thus has a lot of influence on the politics and everything here. Unfortunately, Loro Parque and Siam Park will not go out of business quickly. It will take patience and time. But the time for the tides to turn will come. Loro Parque is well aware that a “post Orca era” will come and is already planning ahead for these future times. How do you see the change coming? There is a growing general awareness about the captivity issue, as films like Blackfish or The Cove prove. Such documentaries have triggered huge outcries and are already massively hurting SeaWorld, Loro Parque’s mother company, in the US for instance. Education is the key – but against the captivity industry! Explain it to the children at school. They will understand and go home and tell their parents not to visit dolphinaria anymore. The less people buy tickets to dolphin shows, the less dolphin parks will survive. Besides education it is all about supply and demand. As just mentioned: Do not visit dolphin shows and tell others not to. Rather go on a sustainably-managed whale watch trip if you visit the Canaries or any other marine spot where cetaceans can be met in the wild. 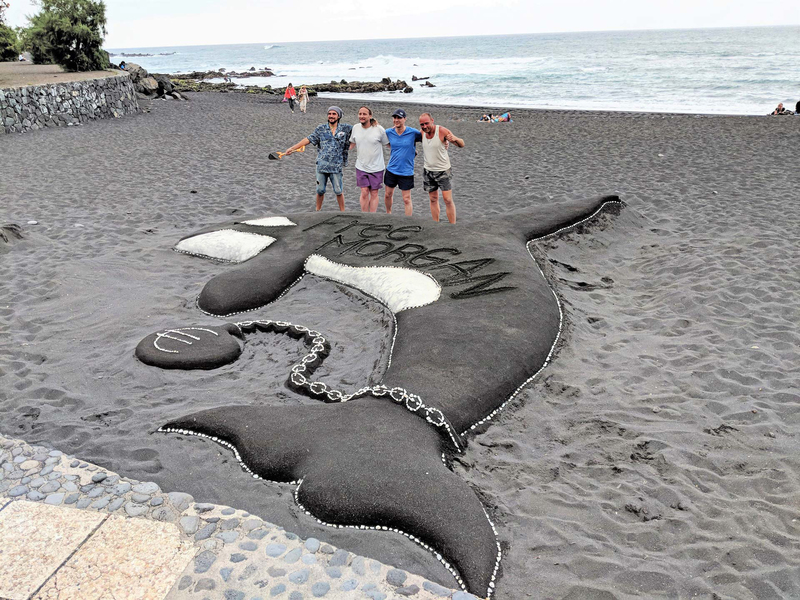 And I really liked this sand art project that called to “Free Morgan”, just 500 meters away from Loro Parque on a beach this May in Puerto de la Cruz. The life size black and white sand sculpture done in co-operation with local artists looked amazing in the dark wet volcanic sand. It drew a lot of attention on location as well as on social media and must have annoyed the folks from Loro Parque. Any traveler can do this, on a smaller or larger scale, with kids or artists – or both. So tourists have a lot of responsibility and influence? Absolutely. But not only abroad of course. You can contribute to awareness anywhere. 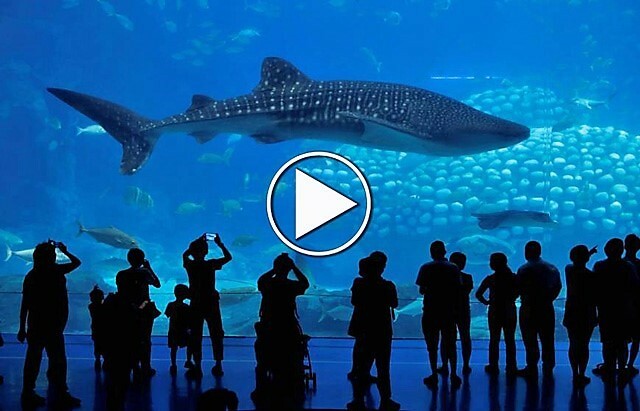 Besides, rather than visiting an aquarium, zoo or dolphinarium, it is so much more educational and exciting to watch a state-of-the-art documentary like “Blue Planet II”. My partner Rafa Herrero and I have had the privilege to contribute to this BBC series which is currently shown on TV channels around the world. I can also recommend some videos we have produced, for instance “Just like you”. You make the difference. Only you. Be the change you want to see in the world. 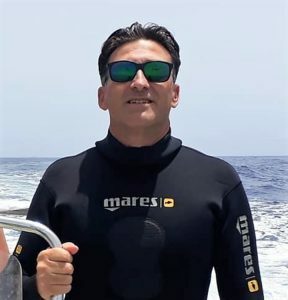 *Andrea Casini from Italy has been living in Los Gigantes, Tenerife, for decades. He co-owns the company “Aqua Work” with professional underwater cameraman and film maker Rafa Herrero. 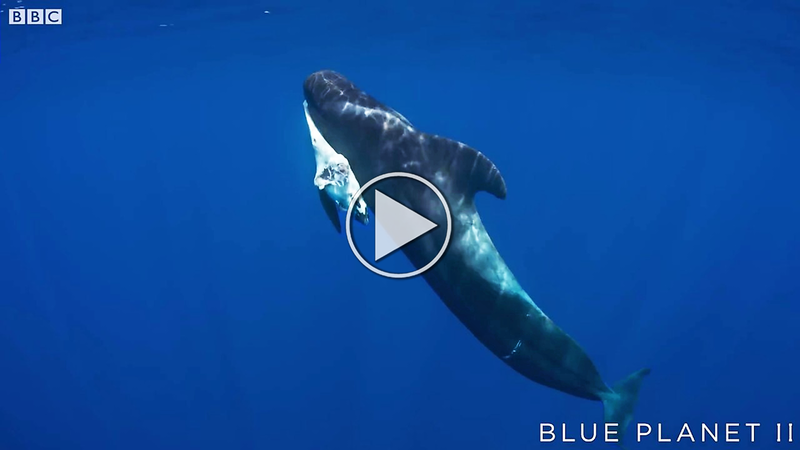 The footage they shot for BBC of a grieving pilot whale mother, carrying her dead baby for days, has sparked momentous public attention in the currently shown new BBC series “Blue Planet II”. Besides creating documentary films and videos, Casini works as photographer, has been a 30th Parallel Expedition team member, is in the Organising Committee of the “Dolphinity World Festival” and runs a restaurant in Los Gigantes, Tenerife. A very interesting and thought-provoking article again. Thanks for drawing attention to the situation and your commitment!